Register now for your free e-newsletter! 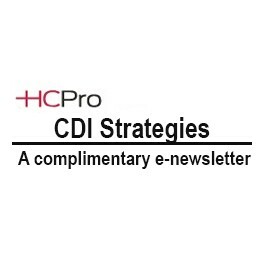 CDI Strategies is a free weekly e-mail resource for CDI specialists and Association of Clinical Documentation Improvement Specialists (ACDIS) members. Every week you’ll receive insight from the ACDIS leadership team, answers to members’ questions from our CDI Boot Camp instructors, invitations to local events, as well as breaking news on developments from CMS, the OIG, Coding Clinic, and more. Stay informed about the latest clinical, coding, and governmental developments in the CDI industry to take your career and your CDI program to the next level. Best of all, it’s free!